UK producer, Sigala, heads into 2016 with a debut No.1 single ‘Easy Love’ under his belt and his second release, ‘Sweet Lovin’’ still in the UK singles chart Top 10 after two months. His new single, ‘Say You Do’ (featuring Imani and DJ Fresh) was recently premiered on Radio 1 courtesy of Danny Howard, being awarded the title of the week’s Future Anthem. 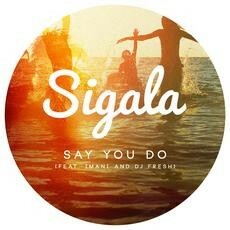 A departure from the big room house of his last two releases, ‘Say You Do’ sees Sigala dropping a tropical-influenced D&B track. The production is a result of his studio sessions with fellow Ministry of Sound artist, DJ Fresh, and the vocal comes courtesy of Imani, the 16 year old former Brit school singer who wrote her first song aged 10 and has apparently already been compared to the likes of Rihanna and Ariana Grande. Nominated for 2016’s MTV Brand New award, Sigala’s been championed by Radio 1, Capital, Kiss, MTV, The Sun, Daily Mirror, Popbitch, Digital Spy, Shortlist, Clash, Complex, SubSoul, and beyond. ‘Easy Love’ recently went Gold, becoming another big one for Ministry of Sound, adding to the label’s 2015 hits with KDA feat Tinie Tempah & Katy B, Tchami, Mike Mago & Dragonette, and DJ Fresh feat. Ella Eyre.